Send your loved ones a cookie postcard made with love! 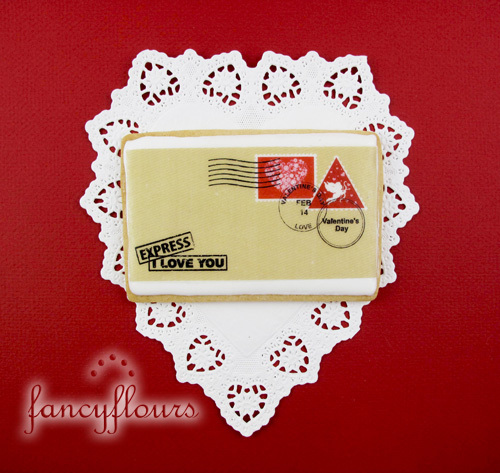 These adorable vintage wafer paper shapes mimic love notes of yesterday. They are simple to make too – View our complete instructions HERE. You will need a Rectangular Cookie Cutter, Express I Love You Wafer Paper, Royal Icing Mix, Edible Writing Gel, and our No Fail Sugar Cookie Recipe for perfect and tasty sugar cookies every time! Don’t wait another minute to tell your sweetie how much they are loved! Homemade cookies make anyone feel special. Find Valentine’s baking and decorating supplies at our online store: www.fancyflours.com. This entry was posted in Cookie Recipes & Ideas, Valentine's Day Baking and tagged Cookie Recipes & Ideas, fancy flours, postcard, Valentines, wafer paper by Fancy Flours. Bookmark the permalink.